The dress was Pat's design and creation. Work on the dress could not begin until classes were finished and there was enough money to buy the materials. Work started May 2, 1975. It was finished the morning of the wedding. 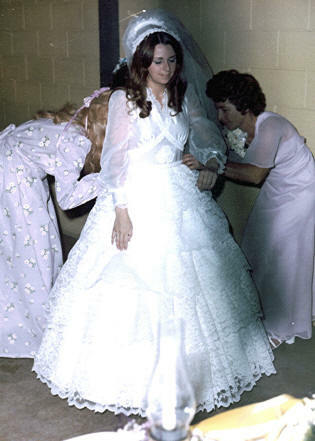 The dress contained 10 yards of satin, 36 yards of Chantilly Lace, 24 yards of netting, 30 yards of trim lace, 10 yards of bridal illusion (veiling), 1 1/2 yards of chiffon and 10 yards of boning in the hoop underskirt. There was a sixteen foot train that could be attached and detached easily through a series of hooks and eyes. The picture at the left is of leAnn Frankenfield, Maid of Honor and Pat's Mother, Ginnie Goheen attaching the train before the wedding. A year after the wedding when mark and Pat were preparing to move to Houston, TX following Mark's graduation, the dress and veil were donated to Goodwill as I knew that with Mark as the father, none of my kids would ever be able to wear the dress.